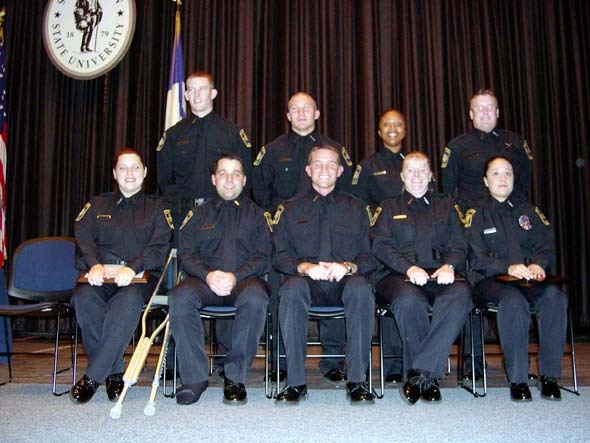 The Texas Police Corps held commencement exercises for its first group of cadets in the Criminal Justice Center Auditorium on the campus of Sam Houston State University Friday, Nov. 19. Nine students were awarded diplomas by director James Heironimus, including Lena Aguayo, Krista Coryell, Steven Jackley, Christina Kindrick, Gavin King, Shane Kasper, Christly Raglin, Blane Rodgers and Lance Schulz. The cadets were addressed by Michael Costigan, executive director of the national Office of the Police Corps and Law Enforcement Education in Washington, D.C., and Jim Dozier, executive director of the Texas Commission on Law Enforcement Officer Standards and Education in Austin. Capt. Shari Burrows of the Friendswood Police Department who was an instructor for the cadets during their 20-week training was selected by the students to be their keynote speaker.
" You will go through many events in your careers, and you may forget some," she told the students. "But you will always remember your classmates," she said. She challenged the cadets to learn from the past mistakes of others and reminded the to be active participants in their families' lives.
" Maintain a safe passage throughout your career," she said, "and take guidance and advice from the police officers who will be in the places you are going to work." She told them to remember that law enforcement is a unique calling, and that they should always "do the right thing." The Texas Police Corps is a $500,000 federally funded, law enforcement assistance program operated by the SHSU Criminal Justice Center. Cadets are eligible to receive up to $15,000 reimbursement of college-related education expenses. Participants who successfully complete the program are guaranteed employment with a participating Texas law enforcement agency. In return, students are obligated to graduate from an accredited four-year college of university, complete the police corps training, meet all requirements for law enforcement certification, and must serve four years assigned to community patrol with an approved agency.